When you are the Master of your own Business, you hold your Destiny in your hands. Please Take Note: That we do not answer the Telephones during lunchtime. All our Staff are on Lunch from 12H00 to 13H00. TRIMO® TRAINING provides affordable practical hands-on training courses. It is true that people who have their own business can make more money than someone working for a boss. Sustainable, Affordable business opportunities that can be started from home is offered by Trimo to help you start and run your own business. When you are finished with the practical training you receive a certificate of completion, a manual for the course attended and mentorship as needed. Many of the business opportunities listed here can be started from home. You can have the best of both worlds by starting your own unique business in your spare time from your garage or home while still working at your regular job! You have the opportunity to test your business idea safely, while you still have a job and an income. Having your own business is a statement of prosperity and wealth. Respect is what you get when you own a business! Change your life today, Invest in your future and prosper. If you do nothing, nothing will happen! Trimo® Training offers skills training courses that will help you to start and run the following affordable, profitable and unique businesses. If you already have a business, you can benefit from the articles on the right hand side of the website. We have more than thirty courses on offer. These courses vary in price as some courses take longer to complete and other courses are more expensive due to the nature of the course. All courses are practical hands on training courses and on completion you receive a certificate of completion. Courses offered are listed on the left hand of this website. Please note that all courses have a certain date that the training takes place. We offer a variety of small business opportunities that are affordable, do not require much to start and are backed by full training, mentorship and support. We have a motto on our courses "There are no stupid questions, the more you ask, the more answers you get!" Here is a list of the current courses that we offer. Courses are rotated and provided on specific days every month. That means that you have to visit our website frequently to check if the course that you want to attend is running. 1. Learn how to make Websites for yourself and the general public. 2. Learn how to manufacture Detergents. 3. Learn how to make different Perfumes. 4. Learn how to manufacture Washing Powder. 5. Learn how to manufacture Funeral Detergents. 6. Learn how to manufacture Coffins and Caskets. 7. Learn how to manufacture Tombstones. 8. Learn how to manufacture Thick Concentrated Detergents. 9. Learn how to manufacture Hand and Body Lotions. Marketing your product is more important than your product and services. Why? If people do not know about your business and what you offer, how can they support your business? For this reason we provide a marketing manual with every course provided. Starting a Business will change your life and set you free. The economy needs entrepreneurs. At Trimo Training we have a saying "When you are the Master of your own Business, you hold your Destiny in your hands." We provide business opportunities that provide full training and backup when you are looking to start a new business. Change for the better with proven advice on successful strategies for your small business. 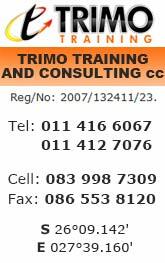 With Trimo you will know the correct steps to take as we provide you with the practical training. Practical training gives you a better chance of successfully manufacturing products that are used every day. Products do not last forever and must be re-bought all the time. More and more people are looking for Business Opportunities. Why? Daily, frustrated men and woman throw up their hands in despair because they cannot find work or have been retrenched. Even if you do find work, it does not mean that it is yours forever! If you can risk losing your job every day, you might as well risk having your own business and making your own dreams a reality, lining your pocket instead of your boss's pocket. All business opportunities listed on this website include full training and support that will enable you to start and run the business that you choose. As soon as you are qualified, you will be able to manufacture the products and offer the services to the public. 1. Learn how to manufacture Hair Care Products. 2. Learn how to manufacture Bath Products. 3. Learn how to manufacture Mechanic and Car Products. 4. Learn how to manufacture Laundry Bar Soaps. 5. Learn how to start a Flower Arranging business. 6. Learn how to start and run a Funeral Parlour. 7. Learn how to manufacture Car wash and wax products. 8. Learn how to manufacture Glycerine soaps. With every business opportunity, you receive a Manufacturing Manual and a Marketing Manual. Apply for your course today!